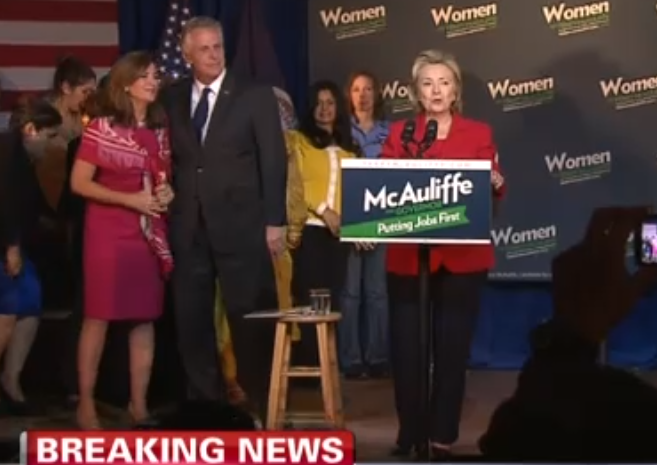 Hillary Clinton was campaigning for Terry McAuliffe on Saturday and therein revealed a multitude of Body Language take-away points. One was that Hillary is absolutely running for President in 2016 (see Nonverbal Communication Analysis No. 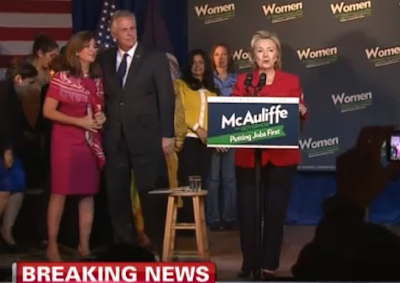 2564: Hillary Clinton Stumping for Terry McAuliffe ... but Did She Hint at Running in 2016?). In this image captured from the video above, the former Secretary of State is seen introducing Virginia Gubernatorial Candidate Terry McAuliffe. Note she is standing behind a lectern which is composed of a thin central metal beam. This allows for much greater visual exposure of the speaker. Greater visibility translates to heightened levels of trust felt by the audience. People trust what they can see, and hiding behind a conventional wide and high, wooden lectern blocks the view of most of one's body. Along with Plexiglas lecterns, these minimalist designs are becoming increasingly popular in the last several years - particularly among political candidates. Intriguingly, all factors being equal, those who use a minimal lectern - or even none at all - will speak with a higher energy level, a greater confidence and enjoy a greater flow and ability to "think on their feet" compared with other times when speaking behind a lectern. This change in tactic, while seemingly trivial to some is extremely beneficial.